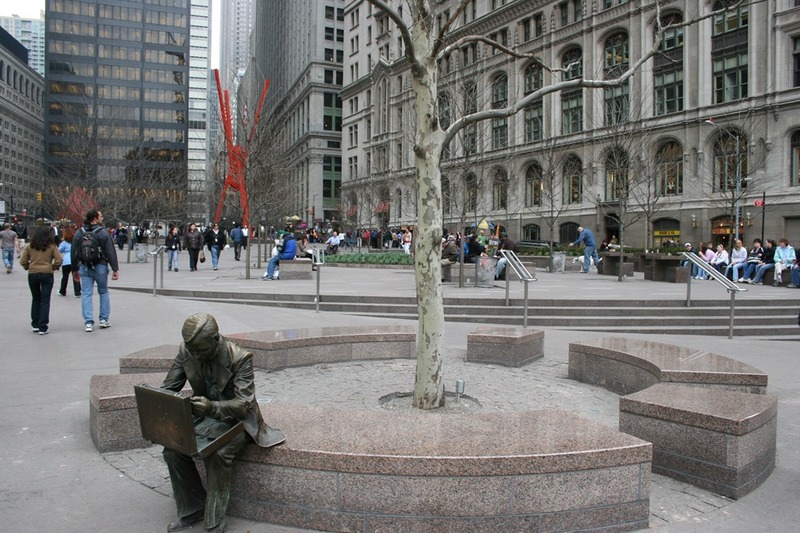 Zuccotti Park is a privately owned public space (POPS), created in 1968 in a deal made by the city with property developers when bonus office space was given to developers if they either created a new "public" space that they then owned, maintained and controled or they took over and renovated adjacent public spaces. This was common practice at the time when the city was bankrupt. Many small parks and plazas in downtown and midtown NY were created this way and they were the vanguard of todays highly successful BIDs, or Business Improvement Districts. Famously Zuccoti Park was the site of Occupy Wall Street in 2011. Ironically its longevity as an occupation was partly due to the park being a private space, and must by law be open 24 hours. If it were a city owned public space the occupation would have been removed as soon as it had been created by the police. One of the owners leverages into removing the occupation was by cleaning the square which it is obliged to do for "Health and Safety reasons". Many of the supposed health and safety violations that the occupiers were accused of were highly exaggerated. One interesting development during the occupation was the changing of the park rules as the owners adapted to the situation. The new rules were taped up over the bronze plaque of listed rules on a piece of paper. These included no tents or tarps.